Miami, Oklahoma —The Miami Arts & Humanities Council, 66 Cultural District and the City of Miami will host their inaugural Mural Fest 66, which will debut five new murals painted by Oklahoma City artists and a local artist at the 500 block of East Central on Saturday, April 29, 2017, 11:00 am to 7:00 pm. The festival will be held on East Central with an artists’ gallery, live music, food trucks and a dedicated children’s area. This project is a part of an ongoing effort of the Miami Arts & Humanities Council and the City of Miami to develop 66 Cultural District in downtown Miami. The five spray-paint enthusiasts will begin painting on April 27 and will debut five brand new murals on Saturday, April 29, during the Festival. The public is encouraged to come watch the artists make these walls come alive. The participating artists will also sell art and exclusive merchandise. More information about Mural Fest 66 can be found on the Facebook page, Mural Fest 66 (link on logo). The four OKC artists, part of the Oklahoma Mural Syndicate, were selected for their exceptional talent and the ability to paint large murals. Jason Pawley, works with graphic, neoned works of art that captivate audiences. He’s been featured in many places including Oklahoma City’s DNA Galleries. He has commercial expertise as the artist behind the full labeling/packaging design for Black Mesa Brewing. Pawley’s use of pattern and color creates an immediate distinction. Dylan Bradway currently works as a graphic designer. He is co-owner of DNA Galleries and co-curator and developer of the Plaza Walls project in Oklahoma City. Bradway’s artwork has been shown at various exhibits throughout the country as well as a solo exhibition in Hannover, Germany. With an urban contemporary style, Dylan’s art holds illustrative qualities when rendering subject matter which is dreamlike and representational in nature. Denise Duong has a deep love for nature, adventure, exploration, and working with her hands. Her whimsical art reflects textures and using different processes of creation. Kris Kanaly is an artist, designer, photographer and art director from Oklahoma City. 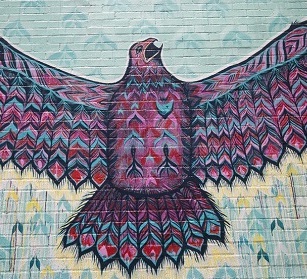 His artwork is regularly on exhibit with various regional galleries as well as numerous outdoor murals and street art applications in multiple states across the U.S. and can be described as contemporary pop, exhibiting a mix of abstract geometric patterns with layers of graffiti-inspired and space-themed influences. Jessica Stout is a local artist and chair of the art program at Northeastern Oklahoma A&M College. Stout’s passion for education and teaching of the arts involves students ranging from those hoping to pursue a career in art to novice students enrolled in Introduction to Art. She has painted historical murals in the Miami Regional Airport and in Chapters Bookstore as well as numerous other works. The Miami Arts and Humanities Council was founded in 1993 to promote, encourage, coordinate and support high-quality programs in the arts and humanities for the benefit of the community. Over the last 25 years the Council has created or hosted programs for the community such as Art for Fun, Youth on Stage, Gilcrease-on-Wheels, and Oklahoma Fancy Dancers. The Council also funds small grants in support of the local arts community and awards scholarships to high school and college students. More information about the Council can be found on their Facebook page, Miami Arts & Humanities Council. 66 Cultural District, located on Route 66 in Miami, Oklahoma, encompasses Main Street and A Streets on either side, from just to the north of the Miami Public Library to just half a block south of Venue 29. The area features public art, the Coleman Theatre, ArtWorx, the Clay Station, Miami Little Theater and an art gallery. It was created through a Cultural District Development Grant received last year from the Oklahoma Arts Council. OAC is the official state agency for the support and development of the arts. The purpose of the district is to develop this mixed-use, pedestrian friendly area in which a high concentration of arts and cultural facilities and events serve as the anchor of attraction for downtown Miami. Some of the goals include creating a more vital and animated downtown, fostering arts education and life-long learning, and increasing our capacity to expand arts and cultural programs and events in the District. More information about the District can be found on the Facebook page, 66 Cultural District.